It doesn't take long to Gideon Beinstock to reach his vineyard : his house sits in the middle of it along the gentle slope of his property in the heavenly peace and remoteness of the Sierra foothills. The whole region is also very different than the more inhabited coastal region, you drive along winding roads through woods, dry-grass prairies patched with trees, and isolated farms, with no malls in sight and the only shopping spot in Oregon House being the local general store/gas station (pictured on right) where we had our breakfast. Oregon House Grocery & Deli is the American general store as you dream it, groceries, drinks, local newspapers, coffee shop, even ATM, and gas station. Who needs malls ? This region of California is also very remote compared to other mainstream wine regions like Napa and Sonoma, and it is also very new to winegrowing; there are only a handful of wineries around here, including the New-Age community Renaissance which was the pioneer in experimenting in a large scale with planting different varieties in different type of expositions here. Gideon worked a few years for Renaissance (he quit since) and his time there helped him advance his understanding on the arduous issue of "what variety fares best on this soil and under this climate", something very important in a wine region with many micro-climates. No wine investor in his own mind would have put money in this virgin region at the time and proceeded therough these lengthy trials and plantings but Renaissance didn't work on business-minded schemes, it is some sort of New Age spiritual group which setlled here in 1971 and its founders wanted I guess to dig roots and make something, so they planted a very large surface of vineyard and built a winery, making wine on a minimalist approach, without intervention or additives. Gideon arriving home on his ATV Soon after I had parked parked the car at Clos Saron, Gideon arrived on his ATV with his young daughter who closed the gate behind them. When Gideon purchased this property there was already 1/2 acre planted with vineyards by the former owner. This first block which he calls the old block was planted in 1980 by a friend of his, Leonard Hill, with varieties being cabernet sauvignon, merlot, a bit of chardonnay and riesling. But the micro-climate here is relatively cool for the region (even though it seemed hot under the sun when we visited) and the cab and merlot never yielded enough sugar to make good wine. Around 1995 the owner asked Gideon if he and his wife Saron could do something with his block. Saron was at the time in charge of the viticulture side at Renaissance and she had a good experience regarding varieties and vineyard management. 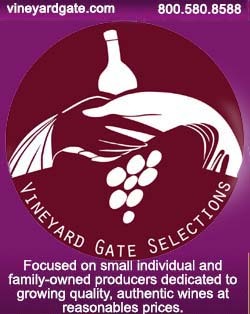 Gideon asked the owner the permission to overgraft the cabernet with pinot, because pinot thrives in this cooler climate. The owner accepted and they not only grafted the existing vines with pinot noir but doubled the density on this half acre with planting baby vines between the older ones. Every other vine is indeed much thinner in this block and Gideon says that they're particularly thinner compared to a regular 18-year-old vine in California, the reason being that the soil is very poor, which slows the development of the wood. There's an irrigation system in place but it hasn't been put to work for the last 4 years. The younger vines like the ones pictured above near the gate are 6 or 7 years old and they are irrigated. The house in the vineyard In 1999 when they bought the property, Gideon and his wife planted more vineyard surface near the old block, almost 2 acres, and they chose a spot for their new home, right above the vineyards. The area was easy to plant except for the trees they had to clear, the soil here has few rock if any while just a few yards away from this property there are so many rocks in the ground that agriculture would be difficult. The vineyards planted in 1999 are still irrigated to this day, Gideon says that without the irrigation the vines would die. He switches on the dripping differently depending of the weather, like once a week if the weather is hot and once every 10 days or 2 weeks otherwise. It depends also of the year and certain plots here haven't got irrigation for 3 years, but it takes time to get the vine roots deep. The soil here is alluvial soil, it is brownish and not red like at Renaissance although it's very close from here. The deeper uindersoil is volcanic ashes, which is also the reason why the vines remain very thin. Asked why these 1999 vines (picture on right) look so thin and frail compared to similarly-aged vines in California, Gideon says that even though these ones are irrigated it's in much more modest volumes than the norm and he doesn't add chemical fertlizers to boost them. Also, in some parts of the vineyard the soil is poorer and the vines somehow struggle and make less wood than in other parts. Sandy, working in the vineyard at one point we walked to chat with Sandy and Megan who were working in the vineyard to do some trimming or bud thinning I guess. They're both from Chicago and came here through WWOOF USA, a non-profit organization that promotes the cultural exchange between organic-farming students and organic farmers. This system allows someone who wants to learn about organic farming to be received for a few weeks in a farm, given shelter and food but no salary. For the farmer it's a way to share and get labor help for their business, and possibly initiate a future relation with someone who wants to work in this field. Here sandy opted for camping in the vineyard but there's a room in the house for them if they want. The weather seems sunny and dry but in the winer months the region gets a lot of rain, something like 55 inches or 140 cm on a normal year. But here too Gideon says, the weather is straying away from its norm so you get now winters that can get dry and while you never saw a cloud between may and september, you now see even occasional rains like 2 weeks before this visit they got 2 inches of rain over 2 days. The valley oak of Clos Saron label Here is a tree you may be familiar with if you ave occasionally some of Clos Saron wines, it's the oak tree on the label. It's yet another variety of oak tree it's called Valley Oak and it's an indigenous type of oak. This one is 200 or 300 years old. The other oak trees around are from a different variety, also indigenous from the Sierra foothills, the Blue Oak. Gideon hanged a wood nest on it to attract hawls that could do a good job at hunting rodents but this free houising didn't found a tenant. the first settlers came in this region some 200 years ago and when Gideon and his wife arrived here it was all covered except for the "old block" by these oak trees and also Ponderosa trees, and he cleared the place with a chainsaw to make room for more vineyards and for his house (in the background beyond the tree). The vineyard has lots of grass between the rows Goose Alert at the pond ! This is a real farm here and they can live in an autarcic way, with all sort of animals, gooses, sheep, chicken and rabbits. They made a small pond near the shade of the trees using the irrigation water, and the other animals are near the house, the whole thing being policed by 5 dogs of all sizes (3 of them on the picture on right) who keep coyotes and rodents at large at large, and from what I'm told the smallest dog is possibly the most combative guardian of the property, with a good record for catching rats. They also raise regularly 2 or 3 pigs, keeping the meat for their own consumption. the pigs were gone when I visited but he was to get soon (october) several piglets and raise them for 8 months. He usually sells one and keep the others for his family. They also grow a vegetable garden. Gideon also planted on a nearby property right next to his, it is owned by a friend of his who let him plant a parcel of vines. They knew each other from their childhood years, they were in the same high school near Tel Aviv in Israel and when this friend visited, he liked it here and decided to live here. Gideon spent his youth between Israel and France and our conversation during this visit was in French for a change. On the side of his lot near his friend's property he planted several varieties over the last 2 years, roussanne, sauvignon blanc, plus syrah, riesling, viognier and petit manseng. His years at Renaissance helped him advance on the choice of varieties and wines for this region. During several years he rented some vineyards at Renaissance and using also his own vines he vinified a white, a rosé and reds. The white was always a blend of sauvignon blanc, viognier and chardonnay. But here on Clos Saron he can't really grow chardonnay because the microclimate has frost in spring (unlike in Rennaissance), so he'll use roussanne instead in the blend. A visitor one day asked if he wanted to make a trial with a petit manseng, and that's why he planted a few vines. He also received a few cuttings of Trousseau from Tegan Passalacqua who works at Turley Vineyards, and he'll probably make a trousseau wine here, like Arnot-Roberts. I can't wait... Gideon should get also from him some mondeuse, but the thing is, with the time it needs here to get a vigorous vineyards, it could be years before we see the color of the wine. Some of his vines are 13 years old and he's still waiting to see a cluster or two clusters. the Stone Soup block, up in the hill We then drive a few minutes from Clos Saron, 15 minutes away but the place is actually only 700 meters from the property "as the crow flies". These vines were planted around 2003 and the climat's name is Stone Soup, and you understand why when look at the ground and countless surfacing rocks. The land is owned by two friends of his who now live in Belgium. Here he has some syrah and a bit of viognier, maybe 10 %. This is an higher altitude, 200 meters more and the temperature is higher too. The soil is really red here, like in Renaissance. It's oriented on the south and is surrounded by trees and woods. intensity. This can be compared to Cornas, he says, where the steep slopes of the North Rhone give very particular syrah wines. The nights are fresh here although less cool than on Clos Saron proper. On this plot you almost visualize the rocky nature of the undersoil as certain vines seem to struggle and don't thicken their wood. the growth overall is very slow but once it get its roots deep it's fine. The first harvest here was 2008 but there was too little fruit and he didn't make a separate wine. 2009 was really the 1st separate wine, then the 2010, which is now on the market. The wines from here got a very good appreciation by critics and consumers because this is a style of syrah that is not common in California. Here also they pick in several times, 2 or 3. What he likes in this region it's that you come across many micro-climates in a very short distance which allows to work with different varieties. It must be said here that his time at Renaissance helped a lot because Renaissance was like a giant trial being made possible by the voluntary work of its members, few wineries would have had the means (and the will) to go through these trials. You learn from this 2012 interview on the left where he speaks mostly about blends, that Renaissance used to have 20 different varieties in all the soil exposures and micro-climates possible, and this over a diffeence of 700 feet between the lower blocks and the highest. It gave him a huge experience about what variety fares best on which terrain and which blend is best from all these combinations. The small facility The whole surface of vineyard with which Gideon works to make his wine makes 7,5 acres roughly, of which 4,5 acres produce fruit. Until his surface is really productive, he buys 2 tons of white, 2 tons of red (for the rosé) and 2 tons of cinsault which he vinifies separately, this all comes from Lodi, 2 hours from here. The cinsault vineyard was planted in 1885 and this is very interesting. Usually in Lodi the yields are enormous, like 10 or 12 tons per acre, while this old cinsault gives 2 tons only. These are ungrafted vines although there's phylloxera in the region and it's all planted around, but the soil is sandy and it helps protect them. Here at Clos Saron the vines are also ungrafted but it's quite isolated, so he hopes they get through. Gideon and his wife pick in several times because the fruit ripens unevenly on the vines. Usually they spend 5 to 6 weeks for the whole property, they work with young volunteers, friends anf neighbors. Gideon says that once their wine is bottled, they wait at least 6 months before releasing the wine, and sometimes much more, like 4 or 5 years... the élevage of the rosé and the white is short, like 3 months while the cinsault which is a simple easy-drinking red gets a 2,5-year total élevage including in bottle and the syrah gets a longer élevage. They have 3 different wines here, beginning with a cuvée which is a blend of all the parcels of pinot or about 2 acres, it is the Home Vineyard, you don't have pinot noir printed in big letters, the emphasis being on the fact that it's the Clos Saron Home Vineyard. __ Clos Saron Older Block, from the first picking early september, as they pick their vineyards in several passes, 4 times last year for example. pinot noir, a parcel planted in 1980 and overgrafted on the cabernet sauvignon in 1995, plus new plantings inbetween the vines to have a higher density, the whole being without rootstock. A bit complicated for a situation but I'm sure you have understood. the nose is different here, and the mouth is very enjoyable, with something like meat juice. While I liked the first blend, this one has somethibg more enjoyable. Gideon says that the age of the vines is differentbut also the soil nature, one has heavy clay on volcanic ashes while the other has lighter clay mixed with sand and samely on volcanic ash. He finds indeed the aromas of this 2nd pinot to be less on dry leaves and more flowery, but with the same minerality. __ Clos Saron, Old Block 2012 (pinot noir, from a barrel); a later picking, a month later. A bit more intense and more fruit. This barrel will be blended with the one we tasted before. Very fresh wine, the color is relatively light, with almost a turbid, milky outlook. I like this one even more than the previous cask. __ Clos Saron 2012, a cask with a blend with most of the pinot parcels around the house. It will be blended with 3 or 4 other casks and make the Home Vineyard cuvée. the tannins are more forward here, with a reklatively lighter color. In the mouth there's almost a candy feel. Gideon says that they try not to get a carbonic maceration, stomping the grapes with the feet for 45 minutes to prevent it, coming back the next day and stomping another 30 minutes. Otherwise he gets certain aromas that hide the character of the wine. They taste the wine every day then, they don't do cap management, just a punchdown per day; they don't do pumping-overs. He isn't looking for extraction, he is interested into the delicate aromas that we have here. His experience is the less you do in the chai and the more of these authentic aromas you'll get. Rather than non-interventionist, Gideon considers that his philosophy is minimalism; while at Renaissance he experimented on many different things, new casks, lab yeasts, different fermentation temperatures, different clones, without batonnage, with battonnage and after these years he's longing for the authenticity of the wine, meaning doing as little as possible. He likes what Jayet, DRC or Bruno Clair do but he prefers the wines of Clair, he tries to make delicate wines without pushing the wine in a certain direction, even if it yields more austere wines sometimes. Clos Saron, the oak tree Gideon says he thinks that California is at a crossroads after so many years overdoing the winemaking on a heavy-handed way, with top maturities, full-bodied wines with syrupy textures, and this era has already passed, he says, even if by inertia these wines still inundate the market. and most wines in California are corrected beginning with the acidity, the lack of which being often related to a wrong picking time and to the irrigation that lowers the acidity. Much of the wine character depends of what you did or didn't do in the vineyatd, and with the type of farming they do here at Clos Saron where vines need 15 years to become productive, there a good side to it because if late, the vines produce a high quality of juice. When you have vines on a deep rich agricultural soil and push them through relentless watering plus fertilizers, you get a diluted juice and you're almost obliged to reach an excessive maturity, but then you get too much alcohol and you're obliged tp take yet others steps to correct that. Here they don't add a single thing and after the wine is stomped it's like if the wine was finished.... Regarding the SO2, in the early years they used to add 35 mg SO2 to the grapes and no more after that including at bottling, then they tried not to add SO2 at all and results were mixed with cycles after bottling when you get symptoms close to lactic spoilage. Now what they do is they vinify and do the élevage without any SO2 and they just add 15 mg SO2 at bottling, which is very little but is enough to prevent spoilage. For bottling they use this simple gravity filler on the left. __ Clos Saron Syrah 2012 Stone Soup. From the parcel we drove to. What strikes me first is the freshness here. Same for the mouth feel and swallow. You drink that easily, very nice, with nice tannins. __ Clos Saron Tinckled Pink (rosé) 2012, the label says : The unexpected silly side of a sun-baked granite slope. Syrah - Tempranillo 50 % each. Bottle N° 1424 of 1495, a small cuvée. The bottle is not fresh but the wine fares fine, very fresh and light, and checking the label I see that the alcohol is very low : 11,2 %, In California people rarely use the harvest to makr a rosé because of money, the wineries prefer to use the bleed juice of a red as a by-product. He sells this wine in restaurants, wine bars. Costs 25 $. Speaking of the sales, he says that they have a very good distribution of their wines including in New York even if Clos Saron has a small production. __ Clos Saron Carte Blanche 2012, 50 % Albarino, 25 % Verdeo and 25 % chardonnay, mostly spanish varieties, albarino is close to riesling he says, at least in terms of acidity and herbal notes, while verseo is heavier and richer with more structure, and chardonnay provides the mid palate. Makes 12,5 % in alcohol. these are purchased grapes, bought in Lodi from Markus Bokisch, same for the grapes used for the rosé. __ Clos Saron Out of the Blue 2012, Cinsault (94 %) vinified with some Syrah and Tempranillo. The Cinsault is the one which was planted in 1885, in Lodi too but from another grower. The nose is very spicy with dry leaves notes. Flower notes too. The mouth is not very tannic. Fermented on skins and stems. Very easy drinking, very nice fruit.. The label says : Own-rooted Cinsault vines planted in the 1880s' are at the core of this distinctive wine. Syrah contributes the tannic and acid backbone. Proudly Natural : no inoculation, acid correction, fining or filtration. New-oak free.. 1495 bottles of this batch. __ Clos Saron Home Vineyard 2010. Pinot noir. On the market for 5 months. 852 bottles only for this cuvée, that's because of the frost in 2010. The nose is pleasantly juicy. Chewy, light, another easy drink without spitting, well balanced. 12,8 % in alcohol. Gideon says that this wine ages well in bottles. He says that his main markets for his wines are California and New York, plus some shipping to Boston and Quebec, also Florida, and atop of that you have the direct shipping to various destinations in the U.S. His public prices are 25 $ for the rosé, 30 $ for the white, 30 $ for Out of the Blue, 55 $ for the Home vineyard (pinot noir) and 50 £ for Stone Soup. __ Clos Saron Stone Soup 2010. Syrah, cofermented with 10 % of viognier, a parcel that they rented at the time but that they don't have anymore. 12,5 in alcohol. I find again these aromas of eucalyptus and dry laurel leaves. The color is a bit darker than the 11. Mouth : same, very nice freshness coupled with minerality and the tannic grip on the side of the mouth, makes a very nice wine. This parcel has also lots of iron in addition to the big stones, and he says that it seems to have an impact on the wine too. interesting that the name of the town is "oregon house" california! how did you survive so far from a wal-mart?